Today promises to be the hottest day of the year here so far. This is a promise I wish Mother Nature would not keep. It’s been so hot here my misery meter has risen as high as the thermostat measuring in the triple digits. Now I know those of you who are reading this who live in a place where the temperature hovers in the 100’s are saying “heat, what heat?” I know summer time means hot. But, it’s just melt your face off hot. Africa Hot! Friggin H.O.T! I have no tolerance for this ridiculous weather! So I’m grasping for anything that has the word ice in it. Ice cream, ice tea, ice cones, ice cubes…I want them all. Oh heck, pack me in ice and wake me when the weather reaches a tolerable 75 degrees Fahrenheit. Lol. Sounds like you need a holiday in Maine! 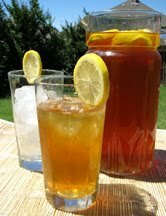 Your lemon ice tea looks wonderful. Drink up girl, the summer is only beginning! I hate the heat as well! I know what you mean, it's very hard to tolerate the heat and humidity! Thankfully, here in my part of Iowa it's supposed to be nice (in the low 80's) this week. Hope the heat lets up for you and you can stay cool! Sounds like it's time to hit the pool! I know it is for me. It will be around 100 today. Wow, I can't imagine living in a place where it can be in the 120's! I guess we can be counting our blessings that it doesn't get that hot here! I hope you find a cool place for the summer! I'm not a fan of Hot either – especially when it is accompanied by Humidity. Yuck!!! I don't what we've done to tick Mother Nature off this year, but we sure are getting a wallop. We've been hovering in the high 90's for a couple of weeks now; my outdoor thermometer has registered over 100 several times. Thank goodness, we've been getting some afternoon thunderstorms that cool things down considerably. You know how sometimes those storms only make things more humid and miserable? Not these; they are most welcome! Hang in there – eat ice cream, drink your ice tea, run through the sprinkler and buy orange push ups from the popsicle man! I feel your pain. I hate to sweat, thank goodness for A/C! It's been 3 digits over here in Modesto, CA as well. Right now it has cooled a little. I stay right next to my ac. I'm not about to sweat like a little pig. 🙂 Take care and try to stay cool. I'm not looking forward to the heat. I grew up where it was 100+ every summer and we ran outside all day. I ran the mile in junior high in that heat. Now, when I go to visit my family, I swear I will melt. My kids even think that outside the door feels like an oven and they come back in. I guess it's an "I love the heat, but I need a drink and some serious AC to survive." We always have hot and humid summers, here in the South. Lots of ac, dips in the pool, and lemon ice tea will help. Stay cool! Beautiful post. It is difficult to live in ot climate if one is broght up in cold climate. I totally feel your pain, I've lived in the Southeast US my whole life and I HATE the heat. Here though we have 95-100 heat and 95-100% humidity so you walk outside and it's insta-sweat…yuck! I'm with you! This heat…it's unbearable. I'm already looking forward to my fall wardrobe and some pumpkin pie! I wanted to say that your apron giveaway is darlin'! I already have a cupcake apron, which I will be featuring in an upcoming birthday celebration, so I didn't want to appear greedy:) Bring on the pumpkins!! !